Finally, the new season and if fifty people were asked to pick five teams to play on the opening day, there is a chance a few would have taken a club with a new manager and then there is a chance a few would have picked Fulham. But that goes both ways. Fulham fans could have wanted a club with a new manager and they'd have wanted to be at home and they might very well have picked us too. That is actually a little depressing - but not as depressing as the letter many received yesterday. Actually, if you think about it, Fulham should be the more optimistic supporters for tomorrow. They've got a manager who has demonstrated ability in this league, while we're taking a punt on a manager to get his previous club relegated from this league twice. Put yourselves in the shoes of a Fulham fan - they might very well be more disappointed if they don't get three points tomorrow, while we will probably be happy with one. I on the other hand, want three points and I sort of expect them. The manager has had all summer with the players, has had time and while there is no substitute for competitive games, Fulham haven't had any either. All things considered, as an aggressive optimist not willing to factor in what Martin Jol might have done during the summer, we are desperate for it and if it doesn't happen, I'll be gutted. Some wont be. I suspect some will be happy that we are playing in the Premier League and write Craven Cottage off as a tough place to go. I went off on one then, but Mohamed Al-Fayed has his supporters trained and in their place. They don't hope or expect for much and they are just happy to be playing in the Premier League. He runs the club much like he used to run his corner shop, so while I might be aggressively optimistic, you wont find a Fulham fan demanding three points. But our owner is also trying to get supporters in that place too. 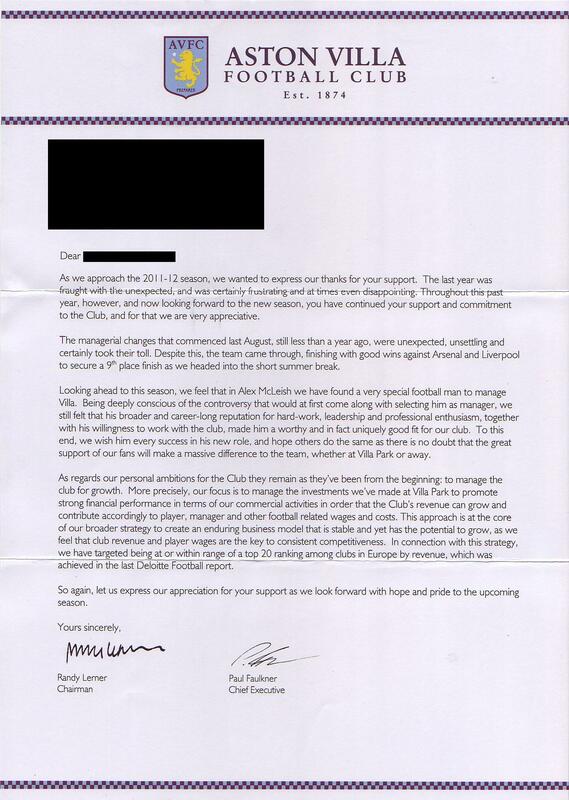 His letter to season ticket holders yesterday basically set the target at a top 20 place in the Deloitte Football Money League - no mention of Champions League or European football. He's dumbing down expectations, getting everyone to accept it and it is wrong. What is more wrong is how people will accept it. They'll even justify it to themselves. It is a tactic and it is working. A few years ago, had this letter gone out, we would have seen protests and uproar in some quarters. Today, nothing. Yesterday nothing. Tomorrow, nothing. We are not Fulham. We are not Everton. We are not Bolton. We are not Wigan. We will be, soon. We will be because that is where we are heading and quite quickly too. The real world is this; to play European football season after season is tough - you need money and you need the squad, but above all that you need the desire and ambition. Where was the desire in that letter to do anything other than make more money and ask yourself this; where does that money go? Somebody is going to write something about supporting the club or team in the comment box below, so I'll get this out of the way right now; I'll support the team for ninety minutes on Saturday and I'll believe we can beat any team, until the 95th minute. Don't question my support for Aston Villa and don't tell me I'm not allowed to question or have ambition for this Football Club and don't tell me I'm not allowed to have an opinion on what is happening off the pitch. And most of all, don't tell me I can't be a little pissed off that we are going nowhere with this attitude of acceptance or that I should be happy with mid table mediocrity or the occasional cup run. Football is about more than that. Football is about winning and drive and fight. We don't really want to win, we have little fight left and the only ambition I can see is that of making money. Yes, the real world is different and this isn't a fantasy football game, but we threw away the last bit of fight on June 17th and I know, I should just leave it and yes, I could be wrong, I even pray that I am and if I am, I'll join the church, if they'll have me, but as of today, I don't think I will be and evenmore are starting to hink that Lerner is only here for the cash. Now for me to make money, even though it isn't much. If you click a link below and bet some cash, there is every chance I might make a few quid. So, with that little rant, I leave you for the day and I will apologise if what I've written above annoys you, but I don't just want to sit back and accept what is happening. I don't want to become the next Everton or Bolton or Wigan. I want Aston Villa to be challenging but I don't have the £500mn to throw away on making Lerner happy and buying success and that is actually what it will take. The game is broken and the vultures are circling, getting what they can out of it. Now for coffee and a request; if one of you going to Fulham tomorrow could pick me up an iPad 2, it would be much appreciated.